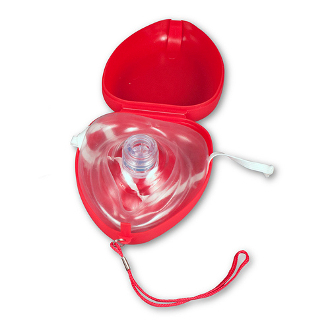 EMT Medical Co., Inc.: CPR MASK WITH HARD CASE & GLOVES ON SALE! Makes resuscitation safer for the responder and more efficient for the patient. Since you won't be pinching the patient's nose shut, each rescue breath will have two avenues of entry into the body. Supplemental oxygem, connected by way the mask's oxtgen inlet, increases concentrations of organ-sustaining oxtgen by 50%. Remove the included valve, and the mask can be connected to a BVM. The BVM with reservoir will increase patient oxygen concentrations to 100%. Completely seals to the faces of infants, children and adults. Latex free.